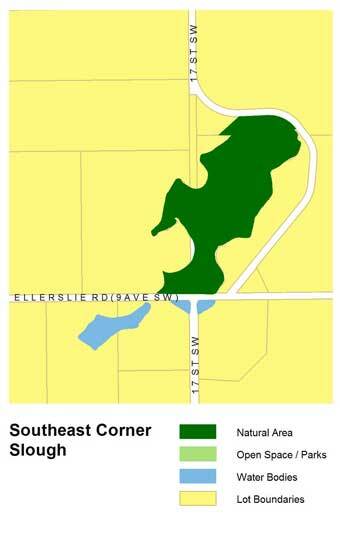 This wetland is the largest permanent water body in south Edmonton. The combination of features at this site provides critical waterfowl habitat that is used for nesting, feeding, and raising young. However, this site’s primary importance is its role as a regionally significant resting and gathering area during waterfowl migration. 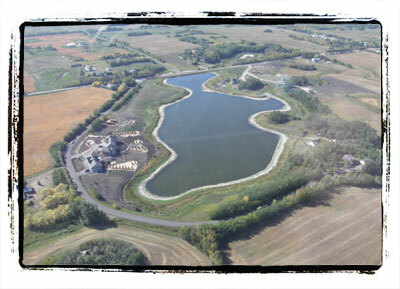 As a result, this lake is a reliable spot to find many different species of waterfowl every spring and fall. A limited amount of upland habitat is present at this site consisting of several small balsam-poplar and aspen groves scattered around the wetland. Areas of periodically flooded balsam-poplar along the shorelines are particularly beneficial as they provide nesting and perching opportunities for other bird species. Access to the Southeast Corner Slough natural area is somewhat difficult as there are no parking areas close by. Although no formal trails are present at this site, the wetland can be accessed along its north side and can also be viewed from the surrounding major roadways. This site is considered to be a regionally important area for waterfowl. As such, there are many opportunities to view a diverse array of waterfowl species. Other bird species, amphibians, small mammals, beaver, and occasionally deer can also be seen and heard at this site.